Most common health problems in Bedlington Terriers, plus health care and feeding. If you want to AVOID health problems in your Bedlington Terrier, you'll find my health care program very valuable. If your Bedlington Terrier already HAS a health problem, I'm sorry to hear that. You should immediately begin my health care program, and you may be able to restore his good health – or at least make him much more comfortable. Let me help! The three main worries are hereditary eye diseases (lots of them), loose knee joints that can require expensive surgery, and a serious liver disease called copper toxicosis. Chronic allergies cause itchy skin, and ear infections can occur due to all the hair in the ear canal. A serious inherited kidney disease in Bedlingtons is renal dysplasia. Some health problems are inherited. For example, if both parents of your Bedlington Terrier have certificates proving they were tested and cleared of hereditary eye diseases and loose knee joints (luxating patella), your Bedlington Terrier has less risk of developing those conditions. Other health problems can be prevented, or partially prevented, by the ways you raise your dog. If you're serious about doing everything you can for your Bedlington Terrier, my best-selling book, 11 Things You Must Do Right To Keep Your Dog Healthy and Happy, shows you how to raise your Bedlington Terrier puppy (or adult dog) in all the right ways. It will help you be your dog's health care champion! Read my advice on daily health care so your Bedlington Terrier lives a long, healthy life and seldom needs to see the vet. How many vaccinations does your Bedlington Terrier puppy really need? Does your adult Bedlington Terrier need yearly booster shots? The vaccination guidelines have changed! Find out what some vets aren't telling you. Retinal dysplasia can be the mild form (retinal folds) or the severe form (retinal detachment). Cataracts can appear in puppyhood or later in life. They can be mild, or they can significantly affect vision, even to the point of blindness. Eyelash abnormalities and tear duct disorders are common. Entropion, glaucoma, and dry eye have all been reported in Bedlington Terriers. Progressive retinal atrophy (PRA) (late-onset, after 7 years old) can occur, but is not common. Copper toxicosis is a serious inherited liver disease in which copper accumulates in the liver. 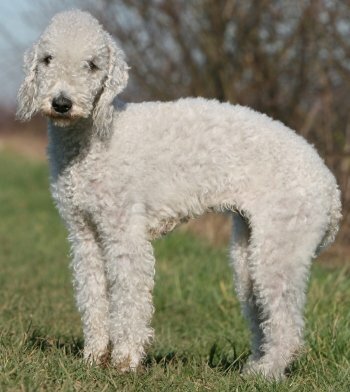 About 25% of Bedlington Terriers are affected, while another 50% are carriers. Fortunately, a simple DNA test is available for copper toxicosis, so you can find out at any time whether your Bedlington Terrier has the disease, carries the disease, or is completely clear of it. Allergies cause itchy skin and often lead to bacterial skin infections (pyoderma). Ear infections can occur due to all the hair in the ear canal. The rate of luxating patella is 8% – the 12th highest rate of all breeds. Hip dysplasia also occurs in Bedlingtons but we don't know the incidence because breeders aren't testing for it.